Nasal congestion is a cardinal symptom of allergic rhinitis (AR). It is associated with decreased quality of life and difficult to treat as perceived by the patients. 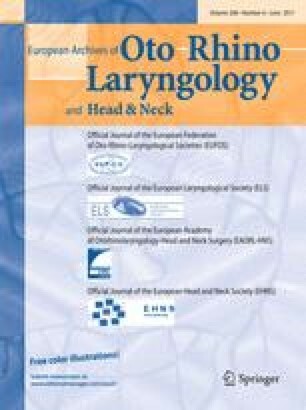 The purpose of this study is to evaluate the mid-term objective and subjective outcomes of management of nasal congestion using intranasal steroid (INS) therapy or radiofrequency turbinoplasty (RFT) in patients with persistent AR who have mucosal hypertrophy of the inferior turbinate. Fifty-five adult patients with AR, who claimed nasal congestion refractory to oral antihistamine (desloratadine) therapy, were randomized to INS (mometasone furoate) or temperature-controlled RFT treatment groups. Outcomes were determined by active anterior rhinomanometry, visual analog scale (VAS), and rhinoconjunctivitis quality of life questionnaire (RQLQ) at least 12 months after treatment. The median total nasal resistance decreased from 0.49 ± 0.17 to 0.39 ± 0.12 Pa/cm3/s (p = 0.42), and from 0.51 ± 0.18 to 0.29 ± 0.07 Pa/cm3/s (p = 0.003) with INS and RFT, respectively. RFT provided a better reduction in the perception of congestion in VAS scores. RQLQ scores improved significantly in both groups 1 year after treatment (mean follow-up 14.2 months) (p < 0.05). No adverse reactions were encountered in either group. Nasal congestion refractory to antihistamine appears to be improved by INS at some point, while reduced significantly by RFT in objective and subjective parameters. Both options are also effective in increasing the quality of life in patients with AR. RFT might be a safe and effective treatment of option in AR compared with INS.